What do the Numbers on Tires Really Mean and Why do They Matter? 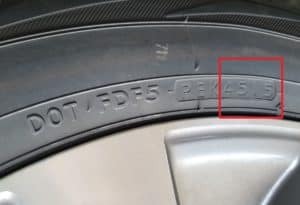 What Do All Those Confusing Numbers on a Tire Mean to You? Tires are some of the most misunderstood parts of a vehicle. There is confusion surrounding when they are worn out, correct pressure, rotation schedules and formats, and more. But nothing is as confusing to the average driver than all those numbers on the sidewall of your tires. We’re here to demystify these numbers and explain them in plain English. See all those numbers on the side of your tire? Confusing, right? We’re here to break those down for you so you can shop for tires with just a bit more knowledge. Each group of numbers represents one dimension. The breakdown is as follows. The “235” grouping indicates the width of the tire from sidewall to sidewall in millimeters. So, in this example, the tire is 235 millimeters — 9.25 inches — wide from sidewall to sidewall. The “55” grouping is the aspect ratio and is by far one of the most misunderstood dimensions. This is the height of the sidewall from wheel to tread relative to the width. Manufacturer’s represent this measurement in a percentage, so in our example, the sidewall is 129.25 millimeters — 5.08 inches — tall (235 x 0.55). The final number group, the “18,” is the size of wheel the tire fits. In our example size, the tire will fit a 18-inch wheel. Some manufacturers build off-road tires using inches instead of millimeters, so you may see sizes like “33×17.” This simply means the total height of the tire is 33 inches and it fits a 17-inch wheel. Can I Change Tire Sizes? Sometimes, there is a great deal on a tire that is slightly smaller or larger than what your vehicle’s manufacturer recommends, so why not just change the tire size? This is a debatable topic, but with modern vehicles having such tight tolerances, it is always best mechanically to only install the recommended tire size. 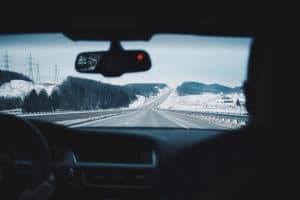 Changing the size on a modern vehicle can cause a dip in fuel economy, abnormal handling, rubbing, alignment issues, and unnecessary stress on the powertrain. If you have an older vehicle — we’re talking early 1980s or older — changing the tire size is not as big of a deal. Generally, the worst issue you will cause by changing the size is an inaccurate speedometer. That said, the only dimensions you can change are the width and aspect ratio — never the wheel size, unless you buy replacement wheels — and you should always strive to keep the total height of the tire the same as the OEM. So, if you widen the tire, you may need to decrease the aspect ratio, and vice versa. Did you know tires also have a load limit? Yes, that little doughnut of vulcanized rubber filled with air can only hold so much weight before it goes “boom.” Fortunately, tire manufacturers put this information right on the tire, but you wouldn’t know it was there without a little insider info, which we will pass on to you now. Right next to the tire size, you will see two numbers followed by a letter. Ignore the letter for now — we’ll get to that later — and focus on the two-digit number. That is the tire’s load index. On most cars, tires will range from the high-80s to the mid-90s, while light-truck tires will fall somewhere from the mid-90s to 120. To figure out what the number on your tire’s sidewall means, you need the load index chart. Fortunate for you, we’ve posted a summary of it below. This load index is per tire, so if you have four tires with a 93 load index, they can hold 5,732 pounds. If your vehicle weighs 4,000 pounds and the tires have a 93 load index, you can add up to 1,732 pounds of people and stuff without risking a blowout. While this load index is rarely of any concern to the average car owner, it plays a huge role when towing and hauling with a truck or SUV. The speed rating is the letter that follows the load rating, but you may also see it following the “R” on some tires. 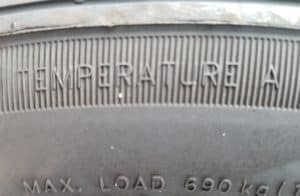 This indicates the maximum speed the manufacturer designed the tire to handle. Like the load index, you need a chart to figure out what speed each letter translates to. Well, look at that — we have one below. 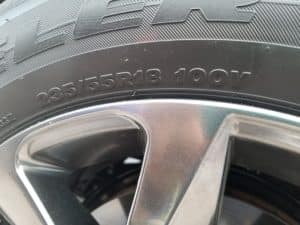 The Department of Transportation number, which some also call the tire identification number, is the longest string of numbers and letters you’ll see on the tire. 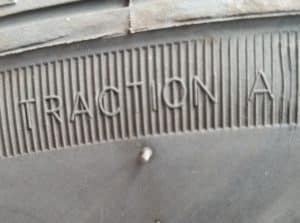 This 12-digit identifier shows what factory the manufacturer built the tire, and the week and year it built the tire in. This date code will be the last four digits in the code. The first two digits represent the manufacture week and the second two represent the manufacture year. In the example above, the DOT Number has a date code of 4515, which means the manufacturer built it on the 45th week of 2015. Typically, the only number you want to pay attention to is the two-digit year code at the end as this tells you roughly how old the tire is. You may think you only need to worry about this when buying a used tire or considering replacing your old shoes, but you also need to look at this when buying new tires. Wait, shouldn’t my new tires be made within the past year? Yes, this is generally true, but if your vehicle has a rare tire size, they may have sat on the shelves for years before you came by to rescue them. Unfortunately, rubber ages while sitting on the shelf, and this could cause issues down the road. Even when buying new tires, always ask to see the exact tires the shop will mount on your vehicle and check that date code. If the tires are over 2 years old, ask for a set with a newer date code. Remember, there is no need to be a stickler here and ask the tire shop to go tearing through the entire tire room to find younger rubber — only resort to this if they are too old. 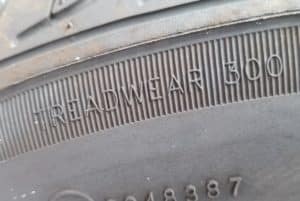 Treadwear is the easiest to decipher as it is a three-digit number that indicates how long tread on the tire will last relative to other tires. In theory and in similar conditions, a tire with a 300 treadwear rating will last three times as long as one with a 100 rating, and so on. This one is sneaky because the government does not require manufacturers to accurately state the treadwear, so long as they do not exceed the official rating. So, a manufacturer can underrate one of its cheaper tires if it outperforms a premium tire to create perceived value for the pricier tire. The traction rating represents how well the tire performs on wet asphalt and concrete. We’ll spare you the science behind it, but it involves a semi truck dragging a tire across wet surfaces and measuring the G-forces. For the average consumer, all that matters is the ratings from best traction to worst are AA, A, B, C.
If you’re in the market for new tires or aren’t sure if you need them but it’s been a while since you got new ones, come to the Garber Chevrolet service department serving Saginaw, Michigan. We’ll inspect your old tires and give you our honest opinion. Plus, you know you’ll get the right tires for your vehicle as we hiring only the most skilled technicians and service advisors. 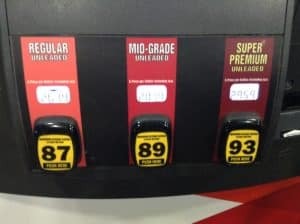 Making the Grade: Should I Run Premium Fuel in My Car? 0 comment(s) so far on What Do All Those Confusing Numbers on a Tire Mean to You?